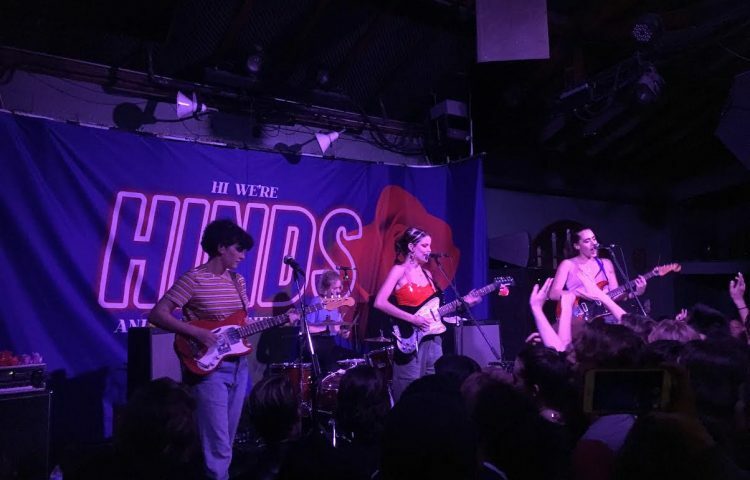 Last week, Hinds and Goodbye Honolulu stopped in Santa Cruz on their 2018 tour to play at The Catalyst. 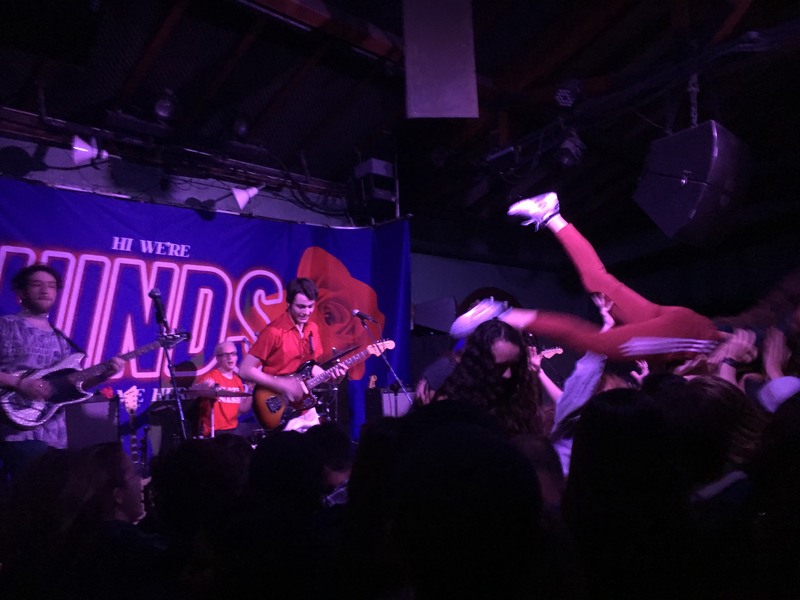 The bands brought forth a lively night of surf-rock music full of stage diving, moshing, and good vibrations felt around the room. Despite my assumption that the bands would play on the main stage, their performance was off to the side at the smaller “Atrium” stage of The Catalyst. However, it was probably for the best due to the stage diving and provided the intimate feeling that only a small stage can. The night started off with Goodbye Honolulu, a perfect opener for the main act of Hinds. Their live performance had more edge than their poppy produced albums, which complimented the mood of the night. It was an added bonus to see Hind’s member Carlotta Cosials sing along and jam out with them from the side. 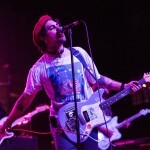 The way the band switched vocal roles felt seamless and kept me captivated for the whole performance; they almost seemed like the male version of Hinds. Each instrument in the band was very interchangeable — with the exception of the drums — with each member being the star of specific songs. 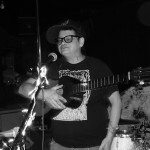 Due to their great guitar flows and drum rhythms, it was hard not to feel the energy coursing through your body. It even made some people jump on and off the stage! A rowdy crowd member stage diving during Goodbye Honolulu’s set. Following Goodbye Honolulu, Hinds amplified the already glowing spirit in the room. Their set started off with plenty of energy but continued to grow even more with each song as the band fed off the crowd’s feedback. Each member brought such a unique contribution to the stage and you could really tell they loved what they do. The members had synchronized dances for numerous songs such as “Caribbean Moon” and even let audience members join them in the groove. 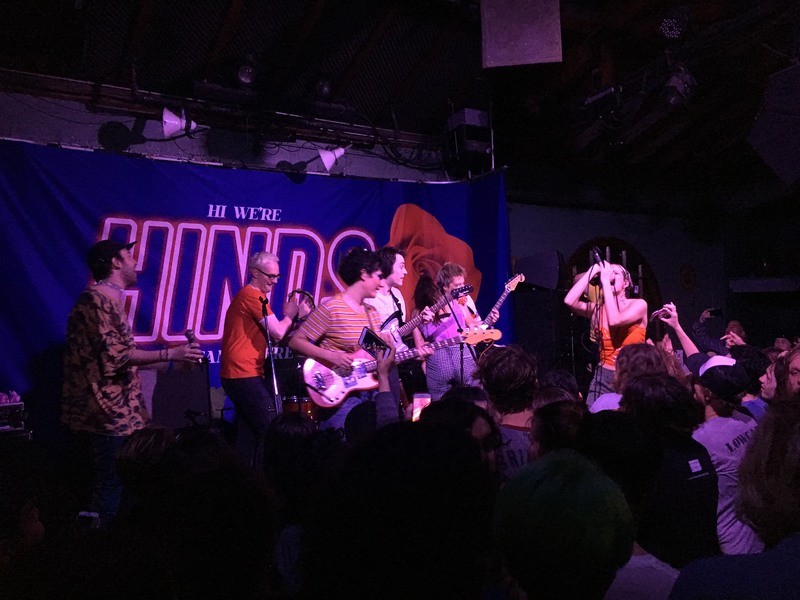 After the bands played their separate sets, Goodbye Honolulu joined Hinds on stage at the end for a collaborative effort. Endless streams of teens started jumping off the stage into the crowd which were followed by members of each band joining them. Members of Hinds even kept playing while being hoisted up by many in the crowd. Hinds and all performing in unison as the final act for the night. Together, the pair made a perfect combination and the finale of stage hurrah was a satisfying ending to the long-anticipated night. 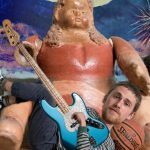 Nick Bishop is a KCPR content contributor, DJ, and a Cal Poly sophomore. He wrote the article and took the pictures.